First of all, thank you for the kind words on my most recent post! There has been such a shift in what I share (and what I want to share) here on my blog in the past few years, and it is nice to be reminded that when it comes down to it, this is my space. That I have every right to choose what I share and whether or not I want to post at all. That I can make it as serious or as fluffy as I want. Thank you to those of you who understand where I'm coming from, and always take the time to encourage me. You're all gems. Being as thrifty as can be is nothing new for me (especially within the past few years, having gone from two incomes to one), but I've really been challenging myself when it comes to finding ways to decorate our home without spending more money on things that are essentially wants and not needs. As much as I'd love to buy a gorgeous mustard-yellow blanket from Target, it's just not going to happen. As much as our deteriorating throw-pillow covers are giving me stress-hives, I just can't rationalize running to Ikea and dropping $40 on something so unimportant. As much as our duvet cover has become worn and faded, unless I can find a new one that is absolutely perfect (and absolutely on clearance), it will simply have to wait. And generally, I'm okay with this. I need to periodically stay away from Pinterest, decorating blogs and give away all my new issues of Better Homes & Gardens without even looking at them because oh, my gosh, the jealousy. Oh, how I'd love to spend so much money decorating and painting walls and buying $3,000 couches (Real Simple, you're dead to me). But at this point in life, our priorities are set, and there are limits to what I can (and should) spend on things like this. However, I've made the executive decision (mostly because Jay doesn't exactly have any emotions about these things) to give our place a few little updates here and there. Little things that don't cost very much money, but make me fall in love with our tiny duplex all over again. 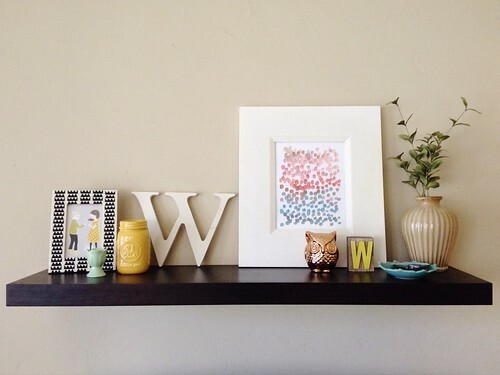 For the past week, I focused on the above floating shelf in our living room. (For reference, a couple other versions can be found in previous posts here and here.) I only updated a few things, but it's amazing what a huge difference it made to me! We spend most of our time in this room, and I love the way this shelf catches my eye and makes a room feel new without actually being new at all. At a certain point, I'd love to share a few other things I've been doing around our humble abode. Finding inexpensive ways to do these sorts of things makes me wonder if I'd even want to spend a bunch of money if we had it. And I love the idea of encouraging other people to think outside the box when it comes to thrifty decor. It's kind of a fun challenge when you think about it. Plus, saving money is my jam.